Represents New Mexico's 1st Congressional District. She is serving her first term in the House. What members of Congress use language that is most similar to Rep. Haaland in their recent press releases? Learn more. 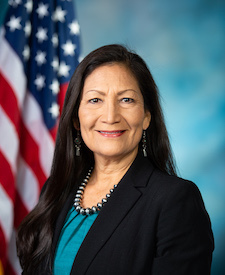 H.R.2311, a bill sponsored by Rep. Haaland, was referred to the House Committee on Education and Labor. H.R.2311: To amend the Richard B. Russell National School Lunch Act to prohibit the stigmatization of children who are unable to pay for meals.